I was honored to lead a team of visionaries on a mission to Uganda, a country afflicted by disease, poverty, famine, and war. My mission was in support of Clovis Ategeka and his nonprofit organization, VisionForce Uganda (VFU). Knowing that the power to transcend and prosper lies in knowledge and education, Clovis envisioned a Uganda where Ugandans play a role in their own self-empowerment. My team assisted Clovis by creating, furnishing, and equipping his Internet café. “Vision Café” would offer resources and services at subsidized prices. Its profits would then support VFU in teaching vision, leadership, and entrepreneurial skills to the youth; giving them the tools to change their lives and the confidence to create their own jobs after graduation. Our mission is to connect Ugandans to the global social community and to support their efforts of self-empowerment. With knowledge and education come prosperity and independence. As Ugandans gain access to more visionary tools, they become even bigger examples and role models for themselves, their families and community, their country, and the rest of the world. This is about the bigger global picture. Their strength and prosperity benefits us all. With empowered focus we will begin to see a decrease in HIV/AIDS, disease, poverty, famine, war, crime, addictions, fear, and terrorism while we witness elevations in the levels of unity, appreciation for diversity, leadership, and service. The population as a whole will grow in compassion and rest far more fulfilled. It is all about connection. We are all interconnected. Pooling our resources innately creates more opportunities and possibilities for everyone. Our journey to Uganda saw us working toward the grand opening of the Vision Café, holding workshops for the local VFU students, and visiting the village of Bushenyi (the hometown of one of our team members, Moses Bekunda). Watch our documentary film, VisionForce: Uganda, to learn more about our team's contribution and the reality of life in Uganda. The raising of $32,771.42 – $3,171.42 over goal! Michael is engaged in ongoing communication via phone as well as Internet in support of VisionForce Uganda students' visions and projects. The VFU students continued to employ the tools and techniques they learned in Michael's workshops to incite changes in their lives, both personal and professional. With newfound trust and self-reliance, many have made remarkable achievements. Their lives have expanded in astounding ways. Michael continues to inspire the VFU students by sending them empowering books and tools. VisionForce: Uganda, the documentary created by Michael's team, has been completed. It is currently being used to raise awareness, to provide greater opportunities and resources for future missions, and to provide ongoing support for future humanitarian efforts. Michael is working with MercyLine Ministries, overseeing "The Poultry Project". This program helps orphans and widows affected by the genocide in Northern Uganda by feeding and funding them while they work toward a life outside of the refugee camps. Art Miles Mural Project's Shoes of Hope is an interactive initiative that spreads inspiration around the world. Donated shoes painted by community Peace Paint Ambassadors are shipped internationally to children in need. In combining the practicality of shoes with emotional, passionate messages; lives are changed, and hope is spread. Visit www.artmiles.org for more information on Shoes of Hope. MercyLine is an independent, indigenous, non-political, non-governmental organization. Its primary mission is to provide education to poor, disadvantaged, and neglected orphans whose parents have died of HIV/AIDS and to help their families overcome poverty and hopelessness in Uganda. 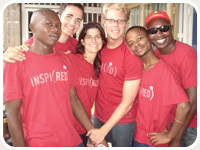 MercyLine works to help them initiate sustainable, income-generating projects. Visit the MercyLine website for more information.